Molly Appleby's career as a reporter for Collector's Weekly is finally taking off, as is her relationship with coworker Matt Harrison. But the more time she spends covering Southern antiques and collectibles, the more times she finds herself face-to-face with a new mystery. And when she's sent to Nashville to cover the famous Heart of Dixie auction, where all the major players in the world of collectibles gather, her hopes of steering clear of foul play are quickly dashed when a renowned and well-respected dealer is found murdered. Sifting through the clues among the aristocracy of antiques is no easy task, and Molly soon discovers the world of high-end dealers is filled with bitter rivalries, shady tactics, and questionable characters. And when one of them makes an attempt on Molly's life, she realizes time is running out, and as she tries to unlock a mystery shrouded in old secrets and new cover-ups, she just might find that what looks like a priceless antique is the key to a very modern murder. This is a fast read with a lot of twists and turns that keep you interested. The plot and the characters are all well developed and realistic. I look forward to the next book in this series. The antique show must go on! Molly Appleby's job as a reporter takes her to Nashville to a major antique show. Who knew so much intrigue could be found at an antique show. Ellery Adams is stories are becoming better with each book. The character's personalities are growing with each murder. Bravo! I just love this author! The narration was great too. 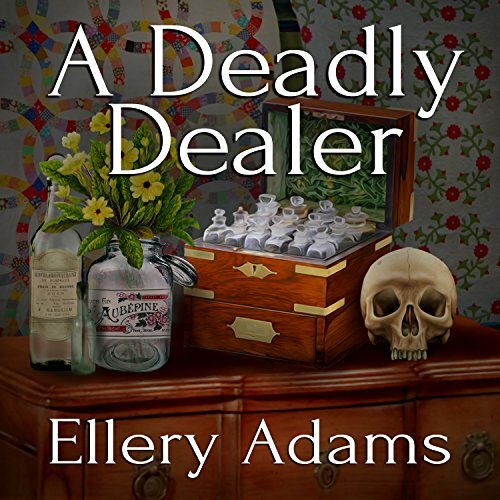 I will continue to buy Ellery Adams books...they are super entertaining. The third in the Antiques and Collectibles Mysteries Series finds Molly traveling to Nashville for a big auction in the Opryland Hotel . . . where old things and curiosities abound, both at the advertised venue and in the hotel rooms, Molly and her mother, Clara (a caffeine addict after my own heart) soon find themselves knee deep in a murder investigation . . . to the chagrin of the local police . . . and wouldn't you know . . . the antique walking stick, a gift that Molly has her eye on as a gift for her boyfriend, Matt, seems to somehow be connected . . . the history of the medical antiques, the walking sticks, and the canes with the little souvenir travel plates tacked on to them (not sturdy enough for actually leaning on . . . but oh, so collectible) . . . the telling of these tidbits make the book for me . . . and the mystery to the murders are always a treat . . . interestingly enough, these collectors are quite serious about their "stuff" . . . seems that there treasures are "to die for" . . . as always things are not as they appear . . . and thrown in to keep things interesting, Molly and Matt have a tiff . . . Clara has a suitor . . . great resolution to the mystery and to the sweethearts' upset . . . Very interesting. No long boring narratives. Enjoyed the light entertaining characters. Will definitely buy more from this author and narrator. This series has gotten better with each book. The characters have really developed & have more of a depth to them than in book 1. I love how Molly & her mom are this mother/daughter sleuthing duo. They perfectly balance each other out, and it's such a wonderful thing to see mothers and daughters work together. Ive never seen that in a series before, & it's my favorite quality that keeps me coming back for more. I like the progression of this series. This is book #3, and each new book is better than the one before. I am not familiar with the world of collectables, but these books are giving a good look into the world, without dragging you down with too much detail. I really like the character developments, both of the primary characters and the secondary ones as well. I've become very fond of Molly, Matt and Clara, and I look forward to the next book in the series.